In many countries today, Kindergarten teachers are in short supply. Even kindergartens themselves are not sufficient to ensure that every parent is able to find a place for their child in the kindergarten nearest to their home. This has been especially a problem in Singapore for the past few years. One of the primary reasons why many avoid this job is because of the low pay. However, things are shifting and Singapore is coming up with a whole slew of incentives to bring the right people into this profession. 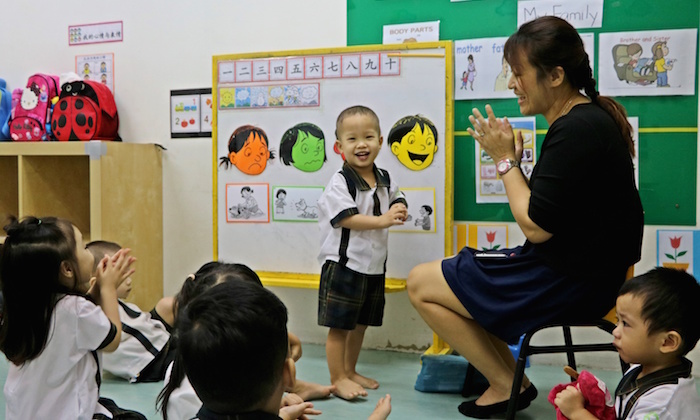 With a recent move, the Ministry of Education in Singapore has launched its own chain of Kindergartens. With basic GCE ‘O’ Level qualification, you can register for a Diploma in Early Childhood Education. This usually lasts about 3 years after which you can apply to teach in a Kindergarten. Alternatively, there are some schools that allow you to work part time and attend a school to get your Diploma too. Here are the career advancement opportunities for a kindergarten teacher in Singapore. In the Ministry of Education (MOE) kindergarten teacher scheme, you can choose two pathways. There are two options, the mentorship track and the leadership track. Depending on your interests, both paths are very viable career progression paths for kindergarten teachers. After many years of experience, kindergarten teachers have a treasure trove of experiences. These experiences can be very useful to new teachers that come in the years after. As such, in this mentorship track, a kindergarten teacher first progresses to a senior teacher and then assumes the official role of a Teacher Mentor. The responsibilities hence change to more of teacher guidance and advice dispensing. This track is more varied and there are several levels of progression. From a kindergarten teacher, you can progress to a Level Head for your subject. Then, you move on to Deputy Centre Head of the school and eventually Centre Head and finally end with Cluster Head. As a Deputy Head, you will be in charge of your subject domain and look after other teachers in the same subject area as you. Your responsibilities may include planning curriculum and activities as well. As a Centre Head, you will be responsible for all the teachers in the centre. In other words,you will be the Centre Principal. When you wish to take on more responsibilities, than you can take on the role of a Cluster Head. In this case, the Head is responsible for all the branches in a particular area. Job responsibilities range from material and activity planning to looking after the interests and welfare of staff in this cluster. Since there is a current shortage of kindergarten teachers, this sector seems likely to grow. Several incentives have been thrown to attract talented, caring and capable teachers. In a sector which used to have only low salaries, now the income for this much needed group of people has also risen in tandem.